Very Good. Emma is happy to sleep in her Cousin Annie's old attic bedroom when staying with her great-aunt Win. But when bedtime comes, she starts feeling nervous. Her brother, Joe, insists that the room is haunted. Could he be right? 64 p. B&w illustrations. Intended for a juvenile audience. Very Good. 96 p. Intended for a juvenile audience. Wonderfully atmospheric yet tender ghost story, firmly rooted in the children's magical tradition, and now available with brand new full-colour artwork by rising star Cate James. High quality cream paper and a special easy to read font ensure a smooth read for all. New. Wonderfully atmospheric yet tender ghost story, firmly rooted in the children's magical tradition, and now available with brand new full-colour artwork by rising star Cate James. High quality cream paper and a special easy to read font ensure a smooth read for all. Illustrator(s): James, Cate. Num Pages: 96 pages, Approx. 20 colour illustrations. BIC Classification: YFD. Category: (JC) Children's (6-12). Dimension: 168 x 126...2017. Paperback.....We ship daily from our Bookshop. New. 96 p. Intended for a juvenile audience. Very Good. 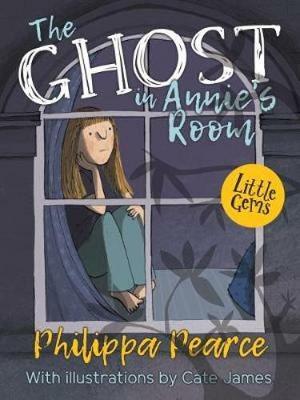 The Ghost in Annie's Room (Sprinters S. ) by Pearce, Philippa, 2001-07-30. 64 p. Sprinters S. . B&w illustrations. Intended for a juvenile audience.